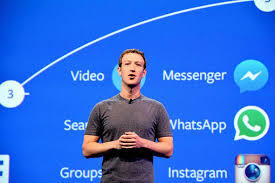 “I see video as a megatrend” said Facebook CEO Mark Zuckerberg recently. If you go online, on your smartphone or computer, you’re increasingly likely to watch video rather than read an article, and the social media platforms are actively promoting video over text. The rapidly changing media landscape presents huge challenges for media organisations and, arguably, even greater challenges for NGOs. 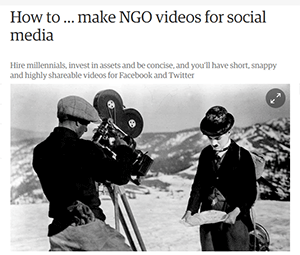 Organisations that want to reach audiences need to produce their own video content. But it’s a crowded and competitive space. And there are major challenges. The algorithms used by Facebook and other platforms ensure that more sensational content is promoted because it provokes stronger reactions. This poses a particular challenge for those who want to produce content that is not sensational. 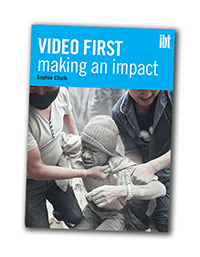 In this report we examine how video is viewed online, what works and what doesn’t, what the latest trends are and we look at some key lessons for NGOs wishing to produce their own content. If you’re reading this, you’ll in all likelihood want to view some NGO videos and comments while you’re here. The following links are not intended as a set of best practice in making videos, but they may well give you thoughts and raise questions in your mind . First in line (both for serious lessons and just for fun) are the annual awards for the best (the Golden Radiator Award) – and the worst (the Rusty Radiator Award) videos of the year. The Awards is an annual event created by the Norwegian Students’ and Academics’ International Assistance Fund (SAIH). By highlighting the best and worst charity ads of the year, the goal with the Radi-Aid Awards is to change the way fundraising campaigns communicate and engage people in issues of poverty and development. Check out the full event Radi awards 2015. Next something at the opposite end of the scale. No millions here to throw at good – or bad – videos. Rather a grassroots army of Video Volunteers helping to create new social constructs in rural India. 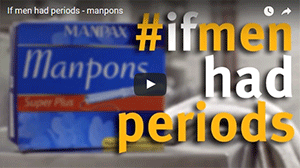 Not many laughs here, but a lot of good ideas, and some might just translate to the UK? … some practical tips and tricks from the Guardian’s Network of Global Development Professionals on making a good video yourself. There are lots more guides like this out there, but this one is short and sweet. Enjoy!